Haryana Group D Admit card 2018 going to release. A large number of aspirants who were seeking a job in the government sector has been applied in Haryana Staff Selection Commission for group D job. After the applied from long time they were searching for when Haryana Group D exam will be conducted and when the admit card will be released for appearing in the examination. Here on this page, we have provided completed information about the Haryana Group D exam admit card. Hope that you may also be searching for the Haryana SSC group D admit card, SSC Group D exam date. So, first of all, I would like to inform you that Haryana Staff Selection will be conducting the written exam from the all the aspirants who have applied for group D job, Exam is scheduled for 10th and 11th November 2018. As you know Haryana Staff Selection has been released the recruitment notification for a group D total vacancy of 18218 posts. Aspirants will be selected on the basis of written exam information. About group D SSC written exam date, Process of selection & Procedure how to download HSSC Group D exam Admit Card 2018. Haryana SSC and all other updated information about the Haryana Staff Selection Commission Group D job can find on this page. Aspirants who will qualify Haryana Group D Exam 2018, they will be selected for the job through SSC on the various department on the post of peon, bealdar, helper, Mali & animal attendant or cook mate, Dhobi and other various posts, for which has been released by SSC. Before going to update you more thing about the Haryana Group D examination first you must know your exam date, It has been released and exam will be conducted on the 10th and 11th November 2018. Admit Card for appearing in the examination it will be available to download for the all the aspirants from the 2nd November 2018. Admit Card of Haryana SSC Exam will available on the official web portal and on this website direct link will be provided. To download Haryana Group D examination admit card 2018 / Group D SSC hall ticket 2018. According to released notification group, D SSC will take first written Exam on 10th November and other on 11th November 2018. An exam will be conducted on various examination centres. It will be held in two shift 1st shift will start from 10:30 AM and the Second shift will start from the 03:00 PM, Aspirants will get One and Half an Hour. In the written examination there will be total 90 objective type question will be asked. Objective Type of question will have come from the general awareness, math, reasoning & Hindi and English subject as well Science subject. A question will be the combination from all the subjects and for the score, good marks students also need to know of the basis of history, current affairs & literature, Geography, Civics and environment culture. As you know that Haryana Staff Selection has releases notification for the various different post vacancy and a large number of aspirants around the Haryana and rest of other state has been applied. All the candidate got application form number while online registration for the examination and now they can also check it their application status. It can be used to download the Group D examination admit card of Haryana Staff Selection Commission. In the admit card aspirants will get complete details about the examination like examination time, examination date, examination venue & roll number and the instruction which have to follow in the examination. Photo and signature will be also available on the admit card. Aspirants are suggested to before going to examination and after the download of HSSC Group D Admit Card can check the following detail very carefully. Hope that you may also willing to know that how to download Haryana Group D exam admit card, to download of the admit card we have mentioned the process stepwise. Note: Please Click On One Of The Below Link (As per Your Application Form No) For Downloading The Admit Card. Then the Various website will be opened for detail of HSSC Group D Admit Card. Read the information and go through that and click on the link. An option will be given for that for it you have to Enter your login ID and password. After entering it will verify and after the verify a dashboard will be open. Then you need to click on the Download/View admit card link. Then admit card will open & click on save. Admit Card will be downloaded, then check out all the details. No, any aspirants will be allowed without Haryana group D admit card to enter into the examination hall. Admit Card will be available to download from 2nd November 2018. 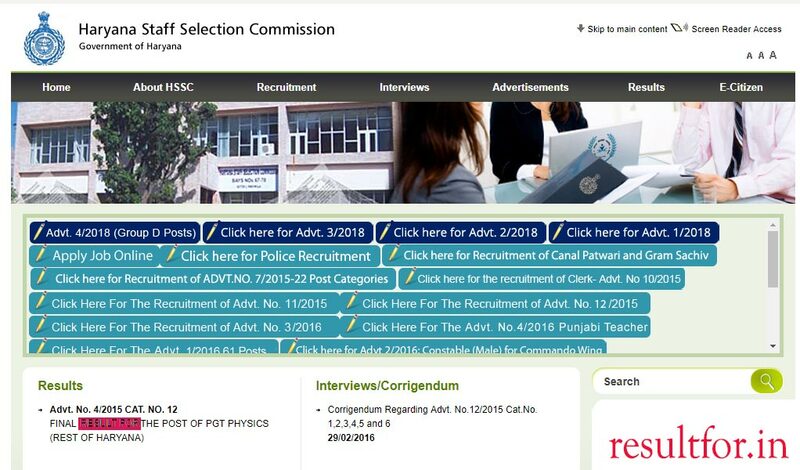 If you have any difficulties to download admit card or have any queries regarding Haryana Staff Selection Commission then you can visit the official website of HSSC at http://www.hssc.gov.in. If you wish to share your query then you can send us through the comment.